Funding innovative, promising research to prevent, treat and cure diabetes. 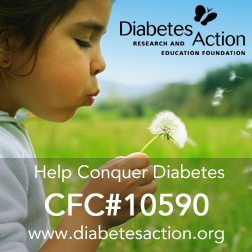 100% of your workplace contributions used for diabetes research and programs. We can conquer diabetes! Diabetes Action has provided grants to over 300 separate research studies at universities and medical institutions across the United States. In addition to funding basic research to cure diabetes with gene therapies and beta cell transplantation, Diabetes Action funds research that examines how nutritional and complementary therapies may prevent and treat diabetes. We are especially excited to announce that a study that we have funded since 2008 to cure type 1 diabetes has just published results showing a lasting blood sugar reduction in people to near normal levels not commonly or safely possible with insulin alone. Diabetes Action has been the only major diabetes organization to continually support this research at Massachusetts General Hospital where Dr. Denise Faustman is using the generic vaccine, BCG, to change the course of type 1 diabetes. Ongoing research hopes to show complete reversal of type 1 diabetes with increased doses of the BCG vaccine. With your support Diabetes Action can continue funding Dr. Faustman's research and other vital studies as well as support our education and prevention programs that can improve the lives of millions of people coping with the daily struggles of diabetes. Your donations are used wisely; we take pride in maintaining a consistently low overhead as well as being among the highest rated charities with top ratings from Charity Watch, Charity Navigator, and the Better Business Bureau Wise Giving Alliance. In addition 100% of your workplace contributions used for diabetes research and programs.